Planet formation, then: it’s quick, easy, commonplace, and completely mysterious. 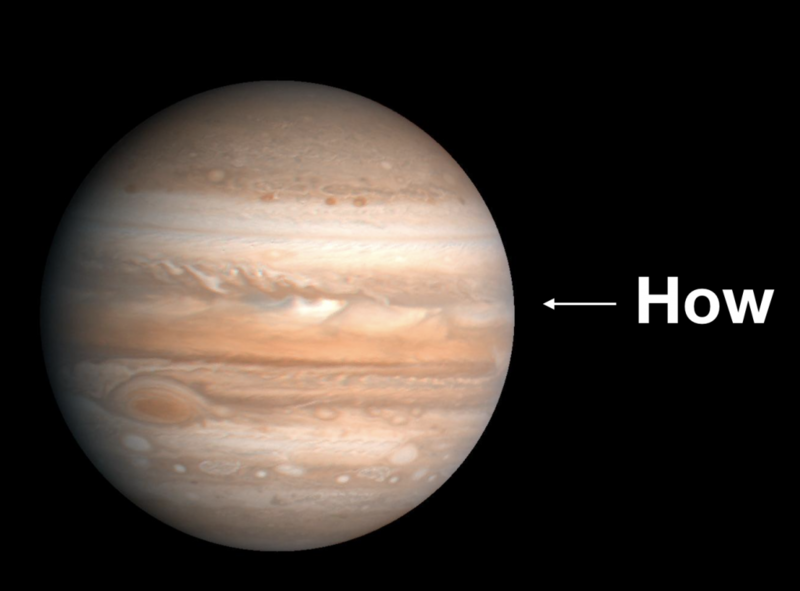 How does a sphere the size of Jupiter coalesce from a bunch of grains of dust swimming in hydrogen gas? Or a snowball like Pluto (planet, dwarf planet, don’t @ me), for that matter, or a rock like Earth? It’s hotly debated. The first hypothesis to gain widespread credence was core accretion, which predicts that planets form small-to-large, with dust particles lumping to make pebbles, and pebbles sticking together to make balls, and balls colliding to make moonlet or asteroid-sized things, and on and on up to planet sizes. The problem with this hypothesis is that building up a big planet by smashing smaller rocks together is neither easy nor quick. When the rocks get to softball sizes and above, further collisions tend to sandblast them, not build them up. And even if they didn’t, this process would take way too long–by the time the growing rocks reached planet masses, the disk would have dissipated around them. Next was the gravitational instability hypothesis, which predicts that planets form like stars do, out of fragmented pieces of the disk collapsing all at once. There’s no reason, though, that gravitational instability would stop at Jupiter masses–why wouldn’t a larger piece of the disk collapse to form a brown dwarf or even a companion star? Even more recently, the pebble accretion hypothesis has gained traction. This one combines the best of the two that came before: it suggests that, in the disk, pebbles grow to softball size by colliding and sticking together, and then some kind of instability concentrates a ton of these pebbles in one place, at which point they clump together gravitationally to make one big rock. Figure 2. A map of millimeter-wavelength continuum emission from HD 163296 protoplanetary disk, from Isella et al. 2016 [closed access]. The problem is that it has proven stubbornly difficult to find planets in those gaps. And indeed, it’s been shown that you don’t necessarily need a planet to make a gap–they could instead be visual evidence of the snow lines of particular molecules, or the result of certain instabilities in the disk. And searching for planets in these disks is much more difficult than searching for planets around older, no-longer-endisked stars–the star and disk glow so brightly that they outshine any planets by orders of magnitude. How can we find them if we can’t see them? Enter today’s paper. Even if we can’t see the planets directly, we can use ALMA to study the motions of the gas nearby. An orbiting planet should gather up all the gas along its orbit, opening up a gap, i.e. a narrow band of low-pressure gas in the disk. 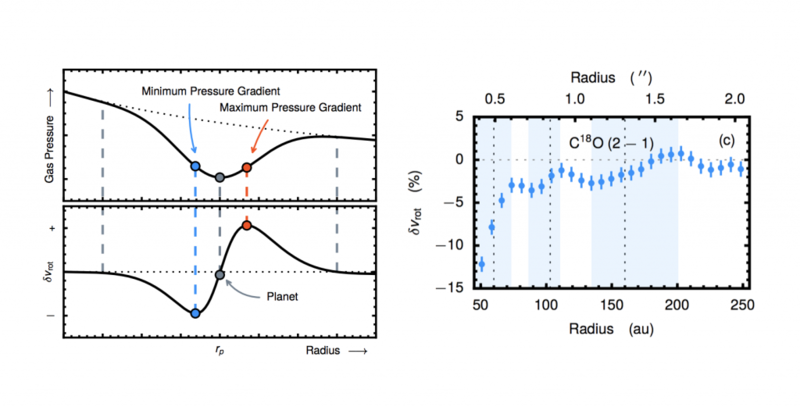 If you look at the gas pressure as you move outward along the disk (see figure 3, top left panel), you should see it dip as you reach the planet’s orbit, then rise again past the planet. The gas molecules in the disk orbit the star because they’re attracted by its gravity, but they’re simultaneously moving too fast to fall in, as well as being pushed away by the pressure of their fellow gas molecules. When the gas pressure changes because of, say, a planet, the gas molecules are thrown out of this delicate equilibrium, and their velocities change (see figure 3, lower left panel). We can observe these changes as deviations from the otherwise unremarkable gentle slowing of the gas as you travel outward from the star. Figure 3. Upper left panel: A planet can open a gap in a disk, leading to a local pressure minimum. Here, pressure is plotted as a function of distance from the star across the gap. Lower left panel: This minimum is observable because it causes the gas molecules in the disk to orbit either more slowly or more quickly than we would otherwise expect. This panel shows the deviation in velocity from the expected value as a function of position along the gap. Right panel: Highlighted in blue are three places in the HD 163296 disk where this type of velocity deviation is actually observed for orbiting carbon monoxide molecules. Notice the characteristic low-to-high slope. 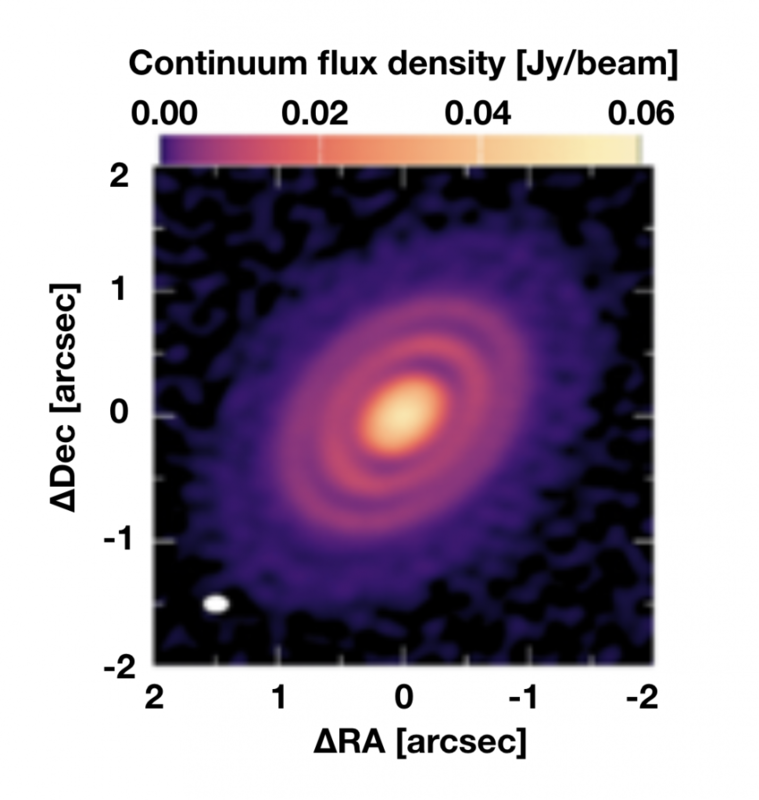 Today’s authors observe exactly these velocity signals in the gas disk orbiting HD 163296. Experimenting with different combinations of planet masses in order to best match the data, they conclude that the outer two velocity signals are likely the signatures of real planets–of 1 and 1.3 Jupiter masses–and that the inner signal might instead be explained by a disk instability, as alluded to above. When they simulate these planets orbiting in a protoplanetary disk like HD 163296, they are able to reproduce the outer two gaps well (see left panel, below). Figure 4. The best-fit simulation to the observations of HD 164396. (All three of these panels are simulated.) Left: gas density; right: deviations of the gas velocity from what’s expected in the absence of a planet. Note that gas interior to the planets’ orbits tends to slow down, and exterior gas to speed up. This still isn’t a direct observation of a planet in a protoplanetary disk, but it’s a promising new method for finding planets indirectly. With enough observations like this one (and ALMA promises to provide many more! ), we might begin to build up a statistical picture of where and how planets form. We’re on the way to solving the mystery!